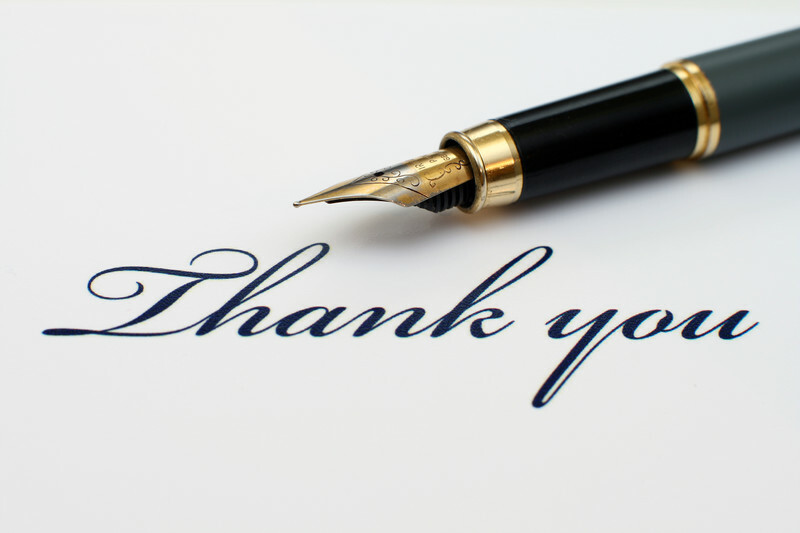 Thank-you note etiquette never changes, even with our culture’s growing menu of communication options. In other words, you should send your thank-you notes on personal stationary or nice thank-you cards. Emails, Facebook messaging, texting, and phone calls don’t cut it. Each note should be personal. Fill-in the blank notes are worse than sending no note at all. Even more, your thank-you notes should go out within three months of receiving wedding-related gifts. For starters, gift givers want to be sure you actually received their gift, especially in the case of those who had something shipped to you. But even those who brought their gift to the wedding want to be sure you actually got it. Who needs to receive thank-you notes? A well written thank-you note is pure gold. You should send notes to anyone who gave you gifts at an engagement party, wedding shower, and your wedding itself. Be sure to send notes to those who hosted those events. In addition, send a nice note to your entire wedding party, including the officiant. And, of course, you should send notes to anyone who helped pay for your weddings (such as parents) and even those who helped plan your wedding. If in doubt, send a thank-you note. Dear Aunt Sarah and Uncle Joe: First of all, thank-you so much for attending my wedding wedding. That meant everything, because you have been special to me my entire life. Sean and I will think of you every time we use the new grill you gave us. We look forward to having you over when things settle down to break in the grill and thank-you properly. Thanks again from us both. If you’re planning your wedding, be sure to check out Queen City DJs wedding services. You’ll thank us for the tip! As times change, wedding etiquette evolves. We work with many couples of all ages and backgrounds, including those getting married a second time. In fact, something like one of three weddings involve couples where at least one of you has been married before. 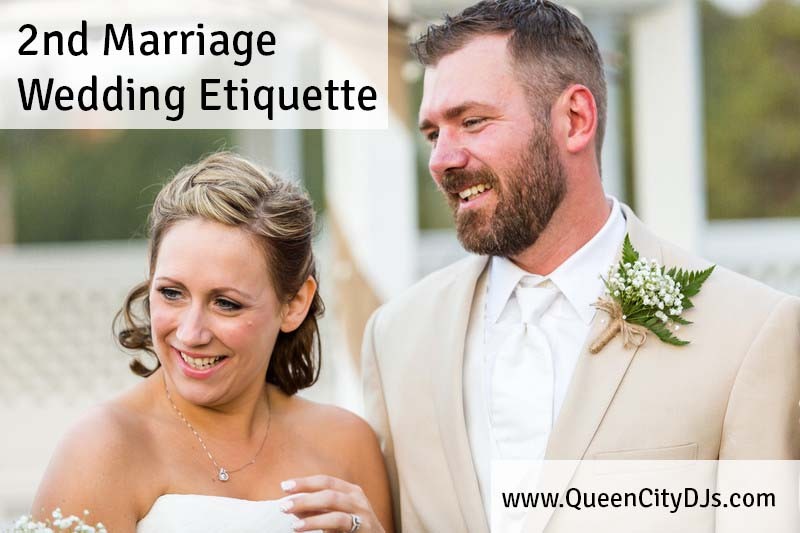 Because this is so common, let’s look at second marriage wedding etiquette based on current cultural norms. If either of you have children, tell them first, and then your parents. You should also tell your ex spouse the news if you have children with whom you share custody. May we throw an engagement party? Absolutely, although parents of the either party don’t typically do this for second marriages. This honor is more likely to fall on friends or other family members, and gifts are not usually involved. Chances are, an engagement party takes the place of a wedding shower. May we put our name in a gift registry? Depending on your age and a number of other variables, you may not even want gifts. That probably won’t stop friends who absolutely want to honor you with some type of gift. So go ahead. Register. A gift registry is a nice way to guide your friends on selecting gifts that truly matter. Does a second wedding have to be a small, intimate affair? Times have changed, and the answer is no. You can invite whoever you’d like, especially since in most second marriages, the couple is paying for the wedding themselves. Except in extraordinary circumstances, you may not want to invite ex spouses and ex in-laws. The obvious exception would be in the case of couples who were widowed, and who maintained a close relationship with their late spouse’s family. Is the bride limited in what she may wear? Yes and no. With the widespread practice of co-habitation, the culture no longer equates white with virginity, so second time brides may wear ecru, ivory, cream, or even white colored gowns, whatever color fits her fashion style. On the other hand, the culture still views a wedding veil as a sign of purity, so second time brides should forgo it. The slide show above showcases some lovely gowns for second time, and more mature brides. May Dad walk the bride down the aisle a second time? Certainly. But also we’ve seen many second time brides walk down the aisle by themselves. And some couples prefer to do it together. What’s right for you? May we have attendants at our second wedding? Yes, but we’ve noticed that most second marriages tend to use fewer attendants than first time marriages. A second marriage is a celebration of love, and like all celebrations, music is THE foundation for your entertainment. We’ve worked with many, many couples getting married a second time. Learn more here. Something that has not changed since the first time you got married is that popular dates book fast, especially in June, September, and October. Check on our available dates right now, and then give me a call to share your wedding dreams at 513-659-9293.